Instructional excellence begins with a commitment to equity and being responsive to how all students engage in learning. Core practices, well-designed tools and routines support the development of teaching. Networked improvement communities based on strong partnerships with local schools and districts can accelerate common knowledge in a system when multiple-role actors are involved. K-2 Modeling and Argumentation with Blended Learning Labs, NSF (Co-PI). In partnership with the Teaching Channel, Northwestern and Elham Kazemi at the UW, we have developed on-line Learning Labs that support elementary teachers in developing teaching practices aligned with NGSS. This year we are partnering with Seattle Public Schools to apply the model to 30 teacher leaders and 350 K-5 teachers across the district. Videos developed in partnership with teachers (scientific argumentation & scientific modeling), and a description of our professional learning model (NSF STEMforAll video 2017). Building Capacity for the Next Generation Science Standards through Networked Improvement Communities, NSF (PI). This design-based implementation project supports the development of local improvement networks with science teachers, coaches and principals in 15 schools and the development of an innovation hub. The community seeks to improve teaching and learning for all students, but EL students in particular. NSF STEMforAll video, Research That Matters publication. Video from AERA conference. 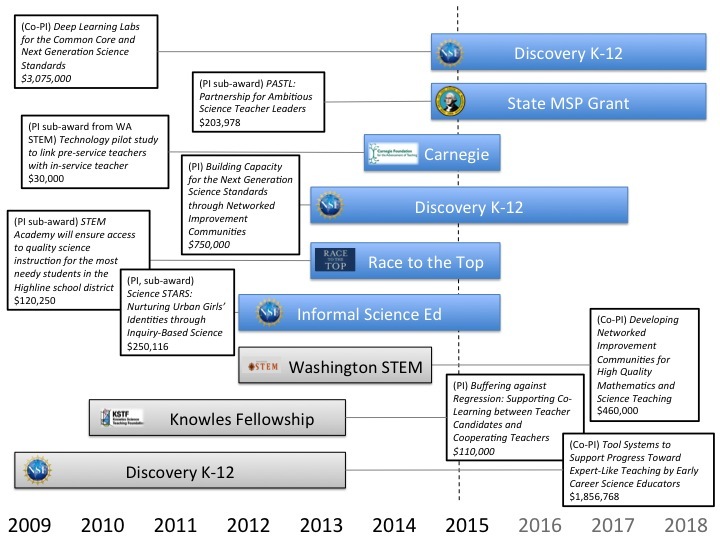 PASTL: Partnership for Ambitious Science Teacher Leaders, WA state MSP (PI). In partnership with Puget Sound, Olympic and Northwest Educational Service Districts, and Seattle Pacific University, and the UW (Thompson, Windschitl, Lohwasser) this project is in its third year developing teacher leaders across WA state, who will support capacity building for regional improvement in ambitious and equitable science teaching. STEM Academy, Race To The Top (PI). The STEM Elementary Specialists program is preparing 20 5th and 6th grade teachers to teach science, mathematics and engineering. We are revising units of instruction and engaging teachers in working on ambitious and equitable practices during the school year as well as during the summer. We are running a summer academy for incoming 5th grade students which will be a site for student and teacher learning. Starting Strong, Race To The Top (PI). Similar to the STEM Academy we are supporting 150 K-1 teachers in developing strong NGSS aligned science curriculum and teaching practices. Developing Networked Improvement Communities for High Quality Mathematics and Science Teaching, WA STEM (Co-PI with Elham Kazemi). This is an efficacy and development project taking a whole-school approach. We are developing job-embedded professional development models that invest in social and material resources and tools to support teachers, school and district leaders in improving a technical math and science core, K-12. Science STARS: Nurturing Urban Girls’ Identities through Inquiry-Based Science (Co-PI with April Luehmann, University of Rochester and Angie Calabrese Barton, Michigan State). We provide urban teen girls an opportunity to participate in rich, inquiry-based investigations and develop their identities as scientists and agents of change in their communities. We are applying ambitious and equitable practices in an out-of-school space and are supporting youth in developing documentaries about advocacy and science. TOOLS4TEACHERS. Thompson and Windschitl developed the core practices and suites of tools found on this website. Tool Systems to Support Progress Toward Expert-Like Teaching by Early Career Science Educators, NSF 2006-2010. Funds research program to develop and investigate on-line tools that support novice secondary science teachers in developing ambitious science teaching practices. Thompson developed an induction program to support novice teachers and has written about early career teachers trajectories and conditions under which novices take up ambitious practice. TOOLS4MENTORS. In 2010 Dr. Thompson was awarded a fellowship from the Knowles Science Teaching Foundation: Buffering against Regression: Supporting Co-Learning between Teacher Candidates and Cooperating Teachers. Thompson worked with a team of Cooperating teachers and district level science coaches to develop tools and routines for mentor teachers supporting novices in learning ambitious practices. We ran summer institutes and monthly meet-ups for folks in in six local school districts. 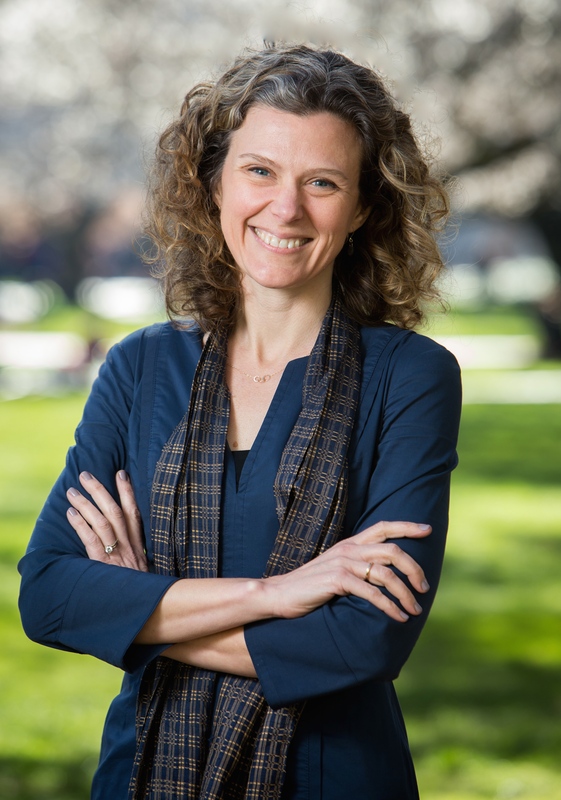 Dr. Thompson also has expertise in working with underserved students in secondary science classrooms and developing interventions that learn from, and support ethnic minority girls' engagement in scientific inquiry (dissertation fellowship from the American Association of University Women; 2007 Selma Greenberg Dissertation Award). She has a background in Biology and Chemistry and taught high school and middle school science as well as a drop-out prevention courses for eight years in North Carolina and Washington State. She has taught secondary and elementary science teaching methods courses and Culturally Responsive Math and Science Teaching at the UW. Thompson, J., Hagenah, S., Kang, H., Stroupe, D. Braaten, M., Colley, C., & Windschitl, M. (2016). Rigor and Responsiveness in Classroom Activity. Teachers College Record, 118(5). Thompson, J., Hagenah, S., Lohwasser, K & Laxton, K. (2015). Problems with ceilings and problems without: How mentoring communities frame and solve problems around ambitious and equitable teaching and learning. Journal of Teacher Education, 66(4), 363-381. Thompson, J., Kramer, A., Carlson, L. Holladay, L., & Sjoberg, B. (Fall 2014). Shifting the intellectual authority in science classrooms from teachers to students: How novice teachers use tools to analyze and advance practice. Networks: An On-Line Journal for Teacher Research. Thompson, J. (2014). Engaging girls’ socio-historical identities in science. Journal of the Learning Sciences, 23(3), 392-446. McDonald, M., Kazemi, E., Kelley-Petersen, M., Mikolasy, K., Thompson, J., Valencia, S., & Windschitl, M. (2014). Practice Makes Practice: Learning to Teach in Teacher Education. A theme issue of the Peabody Journal of Education, 89(4), 500-515. Kang, H., Thompson, J., Windschitl, M. (2014) Creating Opportunities for Students to Show What They Know: The Role of Scaffolding in Assessments Tasks. Science Education, 98, 674-704. Thompson, J., Windschitl, M. & Braaten M. (2013). Developing a theory of novice teacher practice. American Educational Research Journal, 50, 574-615. Windschitl, M., Thompson, J., & Stroupe, D. (2012). Identifying big ideas in science. Science education news. Windschitl, M., Thompson, J., Braaten, M. & Stroupe, D. (2012). The beginner’s repertoire: Proposing a core set of instructional practices for teachers of science. Science Education, 96 (5), 878–903. Furtak, E.M., Thompson, J., Braaten M. & Windschitl, M. (2012). Learning progressions to support ambitious teaching practices. In A. Alonzo & A. Wenk Gotwals (Eds. ), Learning Progressions in Science: Current Challenges and Future Directions, pp. 405-434. Sense Publishers: Rotterdam, The Netherlands. Windschitl, M., Thompson, J. & Braaten, M. (2011). Ambitious Pedagogy by Novice Teachers: Who Benefits From Tool-Supported Collaborative Inquiry into Practice and Why? Teachers College Record, 113(7). Thompson, J., Braaten, M., Windschitl, M., Sjoberg, B., Jones, M., & Martinez, K. (2009). Examining Student Work: Evidence-based learning for students and teachers. The Science Teacher, 76(8), 48-52. Windschitl, M., Thompson, J. & Braaten, M. (2008). How novice science teachers appropriate epistemic discourses around model-based inquiry for use in classrooms. Cognition and Instruction, 26(3), 310-78. Windschitl, M., Thompson, J., & Braaten, M. (2008). Beyond the Scientific Method: Model-Based Inquiry as a New Paradigm of Preference for School Science Investigations. Science Education, 92(3). Windschitl, M. & Thompson, J. (2006). Transcending simple school science investigations: Can pre-service instruction foster teachers’ understandings of model-based inquiry? American Educational Research Journal, 43(4), 783-835. Thompson, J. & Windschitl, M. (2005). “Failing girls”: Understanding connections among identity negotiation, personal relevance & engagement in science learning from underachieving girls. Journal of Women and Minorities in Science and Engineering, 11(1), 1-26. Thompson, J. (2002). Situating gender identities in science engagement. In M. Weinburgh & S. L. Jones (Eds). Proceedings of Gender and Science Education International Conference. Situating Gender and Science Education in Local Contexts. Fort Worth, TX: Institute of Mathematics, Science, and Technology Education. Thompson, J., Hagenah, S., Lohwasser, K & Laxton, K. Problems with ceilings and problems without: How mentoring communities frame and solve problems around ambitious and equitable teaching and learning. (Accepted pending revisions, Journal of Teacher Education). Kang, H., Windschitl, M. & Thompson, J. Designing Learning Opportunities that Advance Scientific Thinking with Intellectually Challenging Instructional Tasks. (Under review Science Education). My courses focus on the relationship between theory and practice. In the science teaching methods (both elementary and secondary) and research methods courses, I emphasize three related phenomena—becoming a culturally responsive science educator; teaching for understanding of science phenomena and the epistemic nature of science; and inquiring into one’s own teaching as a core professional activity. I use tools and practices that align with these themes to help practitioners focus on how and why students engage and learn; I believe this line of inquiry should be at the center of ambitious and equitable instruction and networks oriented to this end.